If you have a custom Minecraft server world from singleplayer, a world downloaded online or shared to you by a friend, or a world from your previous server, you can use this as your server's world. Note: To ensure that your custom world successfully loads on your server, it is recommended to only use worlds that have been generated in the same Minecraft version that your server is running. Using worlds generated in a different version version of Minecraft can cause broken chunks or items to appear, or worse, this can cause corrupt chunks and entities on your world which would lead to constant server crashes. Log in to your server's Multicraft panel (https://mc.shockbyte.com). If you have more than one server, select the server you would like to use a custom world with. Stop your server if it is currently running. This prevents the server from creating any new files or modifying existing ones. Upload your custom world using Filezilla. If your custom world's folder name is "world," this will replace the existing world folder. If you do not want to replace your server's world, rename your custom world to something that is not the same as any of the folders in your server directory. 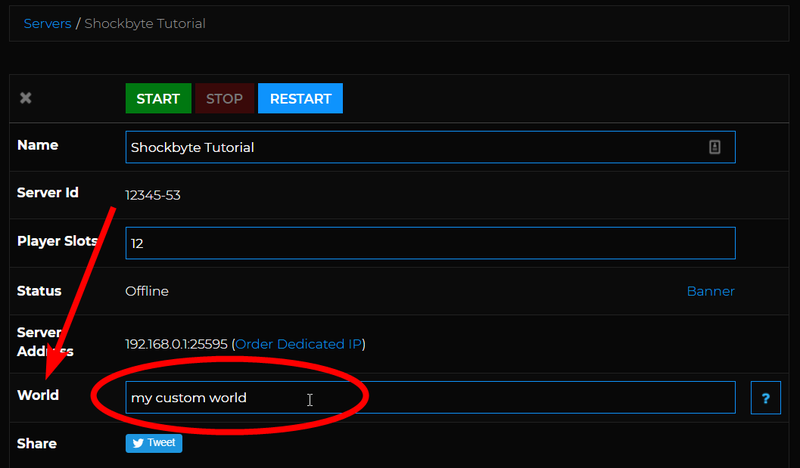 Once your custom world as been uploaded, return to your Multicraft panel. Locate the World option and enter the name of your custom world's folder on the textbox next to it. Click on the Save button found at the bottom of the page. Start your server so that your custom world can be loaded into your server. That's it! You can now use any custom world as your Minecraft server's world!